It just stopped raining, which has made the air even more thick and humid than it was before. But there’s a slight breeze coming off the water. 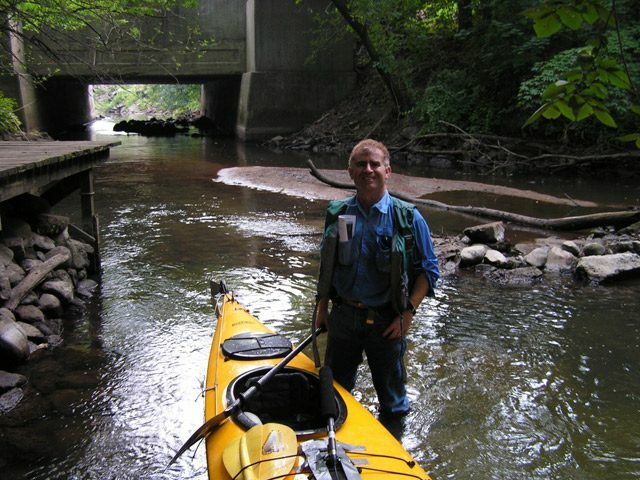 Dave Lemberg from Western Michigan University slides his yellow kayak into the St. Joseph River in Southwest Michigan. We’re at the beginning of a water trail he’s helped to create. It is one of two pilot trails for The Michigan Heritage Water Trail Program. water trails created all across the state. As we paddle down the river, signs guide us from point to point. Along the way the signs tell about the history of the area, and refer to a trail guide that contains even more information. Water trails are popping up all over the country. Paul Sanford is with the American Canoe Association. Last month, the organization launched an on-line database of trails. There are more than four hundred of them. He says people new to the sport like them because they tell you where to go. And he says these days you don’t just find water trails in beautiful areas. On the St. Joseph River, the water trail passes ruins of bridges, old mills, and other remnants of early settlements dating back to the 1800’s. There used to be bustling communities along rivers like this, but many riverside towns were left behind when the interstates took a different route. Dave Lemberg thinks water trails can be a way to revitalize some of these bypassed communities. After a morning on the river, we arrive eight miles downstream from where we started. One of the signs directs us up a creek to the Mendon Country Inn. Gerard Clark is the chef and owner of this historic inn. He says the water trail has been good for business. Clark says the trail is drawing people from all over the region, and the hope is, paddle trails like this one will become a tourist draw in other places as well.